Our New Zealand bus travel timetable will help you navigate your way around our comprehensive travel network. It shows pick-up days, pick-up points, and approximate pick-up times (remember that any pick-up point is a drop-off point too). During summer most of our bus stops have daily pick-ups/drop-offs. In winter each location will have at least 3-4 departures per week. Contact our friendly Kiwi Experience crew for more information on +64 9 336 4286. To see what days the bus departs each scheduled overnight stop view our timetables. When jumping off just let your Driver Guide know and make sure you grab your ticket. 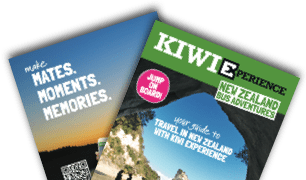 When you want to jump back on and continue your New Zealand bus travel adventure, contact us in advance so that we can make sure there is a spare seat waiting for you. This is a really important point – if you don’t call us we won’t know where or when to pick you up from. Everyone wants to travel with Kiwi Experience, especially in summer, so the more time you can give us the better! For the ‘Unlimited Travel’ option of this pass, the whole route needs to be completed before any sector can be repeated. When starting this pass in Christchurch, you should travel north and complete the North Island route before travelling south to complete the South Island route. This way you can complete the whole route and then repeat the sectors that you want with the ‘Unlimited Travel’ option. If you wish to repeat the Christchurch to Picton sectors of this pass before you have completed the whole route, the standard Christchurch to Picton sector prices will apply. Please see point 19 of our Terms and Conditions for all Terms and Conditions specific to ‘Unlimited Travel’. The pick-up times below are approximate only and are subject to change. Always check with your Driver Guide or our reservations team the day before departure to confirm departure point and time. Please be at these pick-up points 15 minutes before the published departure time. The bus will always stop at the Main Pick-up point, and other pick-up points by request (please phone us at least 24 hours prior to departure). Pick ups may be delayed due to activities. Pickup times can vary due to the interislander ferry schedule. Pick up must be confirmed day before departure.